I wrote ten blog posts documenting my journey at OCEANDOTCOMM. You can find those posts through the tag #odotcomm18. On my AGU blog, I posted about the application phase and my acceptance to OCEANDOTCOMM, a collaborative, storytelling, social media event hosted by the Louisiana Universities Marine Consortium (LUMCON). This was described as a “multi-day, residential event is geared toward science communicators from any background that want to innovate new models in science communication and be part of the greatest science narratives ever told.” There was a theme for this gathering – but the theme would not be unveiled until the evening of the first day. It is the first time I’ve been to a gathering of scientists and science communicators and had no idea what we were going to be doing! So I’ll admit – I was a little nervous as I didn’t know exactly what I was getting myself in to, but just so curious (that’s the scientist in me! ), that I was excited to see what was in store. I had a morning flight out of Philadelphia (delayed taking off, of course) and landed early afternoon in New Orleans. Myself and five other participants piled into a van for the 1.5 hour trip down to LUMCON, located in Chauvin (see Google Map). Throughout the day and evening, the 40 event participants arrived and moved in to our dormitory-style housing to settle in for the next five evenings. I spent some time exploring the facility and grounds with my roomie (a wonderful, creative and passionate K-12 teacher from Florida) before heading to dinner. It was quite a buffet with several options, we will clearly be well fed! We then gathered for our official welcome from Dr. Craig McClain, Executive Director of LUMCON. I thought it was a very smart beginning, providing each of us a copy of LUMCON’s Equal Employment Opportunity/Affirmative Action Policy. There is no question that Dr. McClain is creating a supportive and inclusive environment for all of us during our time at the center. 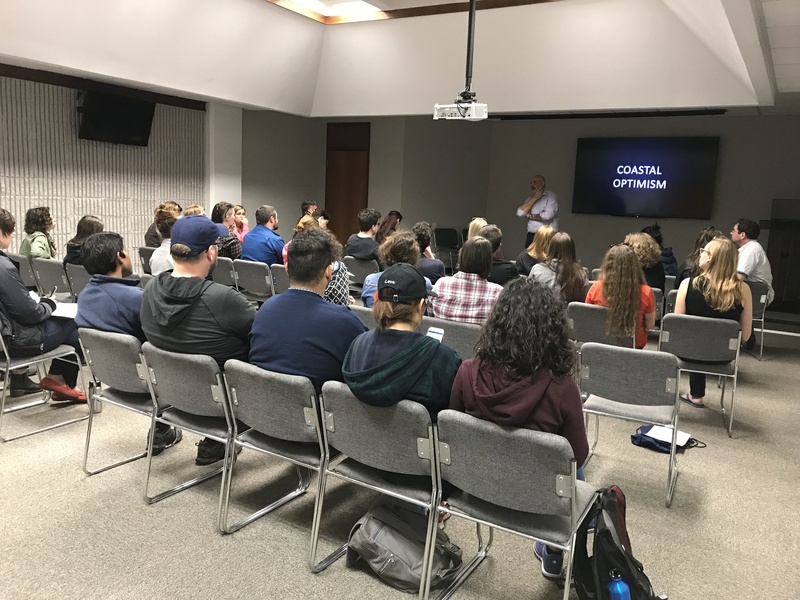 After sharing the history of LUMCON, and presenting us with a few teasers to heighten the tension, we finally learned the theme of our gathering: COASTAL OPTIMISM. Here is our challenge for the next several days – we need to celebrate the scientists, the funding, and the success stories of what is happening in Louisiana’s environment. Yes, Louisiana has been losing its coast for a variety of complex reasons – sea-level rise, diversion of the Mississippi River, subsidence of land, loss of vegetation… and the media is always focused on reporting the loss of the coast. Just look at a recent 3-part New York Times series on Louisiana’s vanishing coast as an example. Dr. McClain would like to see us work on stories of hope, stories that share success in addressing local challenges. I think this is going to be a great exercise. Consistently, students tell me that they find my courses depressing, that there is too much focus on what is wrong with Planet Earth, and they feel helpless to do anything about it. I believe this is exactly what Dr. McClain is trying to address, moving beyond the fear and negative reporting with something that celebrates what is working. I look forward to starting tomorrow with gaining more of the background information, and then heading out into the field for exploration! This blog post was created from OCEANDOTCOMM and supported by the Louisiana Universities Marine Consortium (LUMCON).